African Development Bank (AfDB) president Akin Adesina. President of the African Development Bank (AfDB) Akinwumi Adesina was yesterday in Lome,Togo, awarded the Commander of the Order of Mono, the country's highest civil honour, by the Head of State of Togo, Faure Essozimna Gnassingbé. 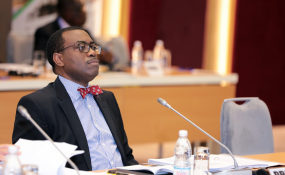 A statement by AfDB's head of communication, Olivia Ndong Obiang, said the national honour, bestowed on personalities who have shown exceptional merit, was given to Adesina during his visit to the country for the launch of the Mécanisme Indicatif de Financement Agricole (MIFA), a programme designed for improving farmers' access to finance. The initiative, based on Nigeria's incentive-focused, risk-sharing agricultural leading model, aims to provide one million farmers with access to credit and reduce the risk of lending to agriculture. In his address at the occasion, Adesina said, "Transforming agriculture is the key to reviving rural economies and turning them into new zones of economic prosperity. The MIFA initiative you are launching today is another building block in Togo's agricultural transformation strategy jointly developed by the African Development Bank and the Government of Togo, with the support of the Nigeria Incentive-Based Risk Sharing system for Agricultural Lending (NIRSAL)." He said, "When fully implemented, it is expected to rapidly increase bank lending to the agricultural sector, reduce interest rates, and reach 1 million farmers with access to credit in the next three to five years." In attendance at the event were members of Gnassingbé's cabinet, including Prime Minister Komi Selom Klassou, members of the diplomatic corps, President of the International Fund for Agricultural Development (IFAD), Gilbert Fossoun Houngbo, NIRSAL CEO, Aliyu Hameed, as well as representatives from the private sector. MIFA is based on Nigeria's successful experiences with NIRSAL, where it helped de-risk lending by commercial banks to agriculture. IFAD President Houngbo said, "Innovation is critical to boost the agricultural sector which remains a cornerstone for achieving the Sustainable Development Goals. MIFA is an innovative financial mechanism which will help support smallholders technically and financially." According to Prime Minister Komi Selom Klassou, who launched the operational phase of MIFA, agriculture accounts for 46 per cent of Togo's Gross Domestic Product with vast growth potential. "This innovative instrument is a 'relief' and pragmatic response to the problem faced by small farmers who receive low financial support because of high lending risks," Klassou stated.